This Week's Tarot Card Is the Ten of Cups! Last month's work with the Tower card has us feeling a little vulnerable as we enter the month of May, and this month's theme card of the reversed World indicates this is all still a work in progress. Whenever we invite great change into our lives, we must also allow time to adjust -- time to turn attention back to areas of life that have been temporarily neglected. With this new theme card, the focus is on realignment and completion. Each week this month gives us an opportunity to build on the last as we strive for the ultimate achievement of balance. 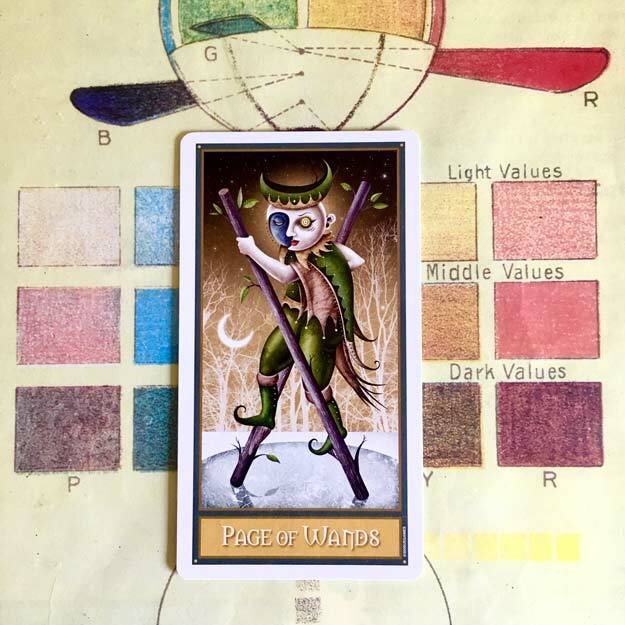 This month I'll be reading with the Deviant Moon Tarot deck, the strange and wonderful creation of artist Patrick Valenza, originally released in 2008 by US Games. 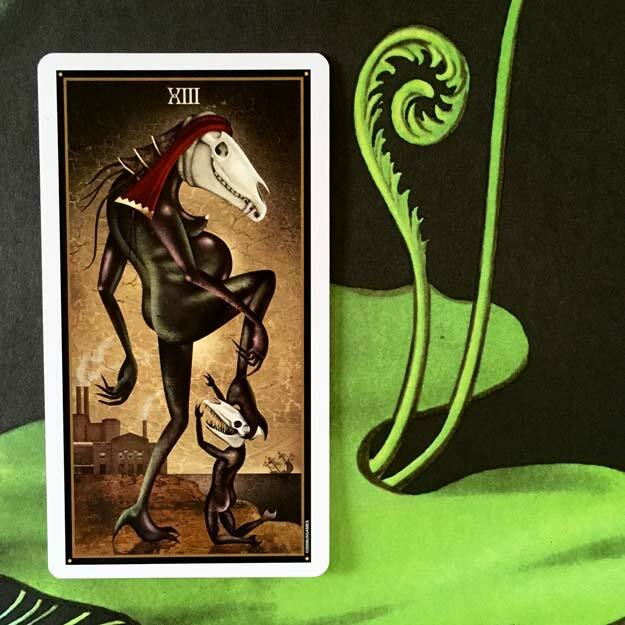 Dramatic, moon-faced characters play out versions of traditional Tarot symbolism against surreal industrial backdrops. You can see the full deck here. In most Tarot decks, the World is the final card in the Major Arcana. It signifies completion, the end of a period of self-discovery. In the Deviant Moon Tarot, the World card emphasizes the cyclical nature of that journey through the use of the ouroboros symbol, a snake eating its own tail. The ouroboros is an ancient symbol of the perpetual cycle of death and rebirth, a symbol of renewal and transformation. 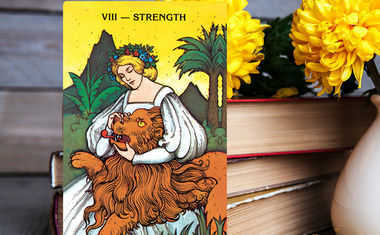 While we want to be enjoying this sort of renewal now, especially after a time of upheaval and hard work, the card's reversed state suggests our journey is not quite finished. The World is topsy-turvy, and some vital piece needed for righting it is missing. We'll explore how the coming weeks' cards might help us find this missing piece, but first, let's try to clear any impediments that might be delaying our progress. What do you currently desire? What do you feel in your physical body in this moment? Allow yourself to answer honestly, free of judgement. Make note of moments when you experience fear or doubt, but do not let those negative thoughts overwhelm you. You'll have the opportunity to work actively in these four realms each week as the month unfolds, starting with the following card, the Magician. Find the guidance you need for every facet of your life now with a personal Horoscope Tarot Reading. One approach to the dilemma of this month's theme card, the reversed World, is to use the intellect and the will of the Magician to solve problems. 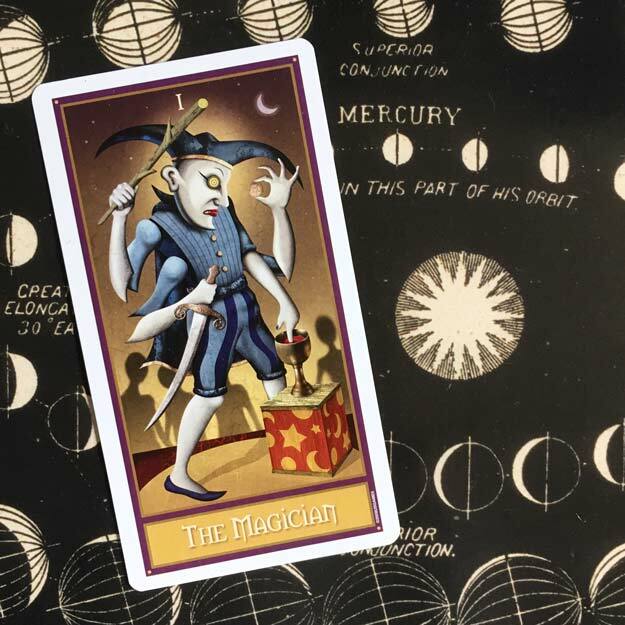 The Magician is a card of great skill -- skill achieved through study and practice and executed with channeled energetic power. 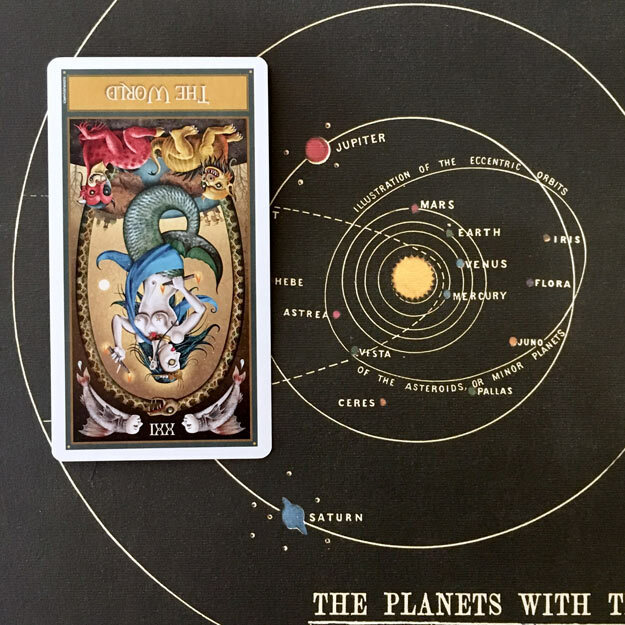 For those of you interested in the connections between Tarot and Astrology, this card is influenced by the planet Mercury, ruler of communication and translator of ideas into action. Through this connection, the quick-thinking Magician is an agent of change that can help us complete what we started in recent periods of adjustment. 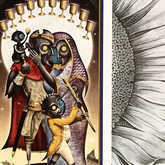 Just like the World card imagery in many Tarot decks, the Magician imagery includes aspects from all four realms of life, represented here by symbols of the four suits of the Tarot: mental (Swords), spiritual (Wands), emotional (Cups), and material (Pentacles). These are the tools of the Magician, wielded with practiced power and cleverness. The Magician's dexterity is further emphasized in this image by his great number of arms that are busy at work, each one using a different tool simultaneously. 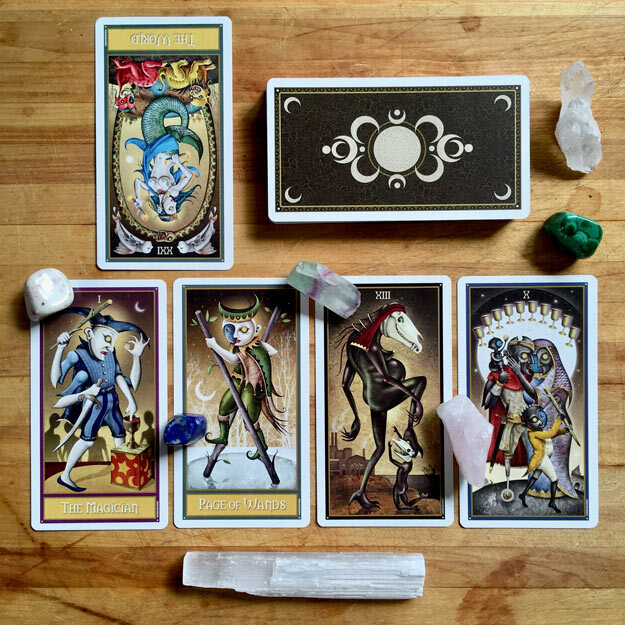 We saw the Magician as our final card of the December 2017 Tarot Reading, and it invited us then to set some goals for the coming year, 2018, which we are now nearly halfway through. It's the perfect time to reconnect with this card and its useful forces. Next week's card, the Page of Wands, will focus on actions taken with these tools. This Page of Wands strides on stilts across the ice, willing to take whatever risks are necessary to explore new territory and experiences. The character is undaunted by obstacles, proceeding with a spirit of adventure and curiosity, comfortable with a certain amount of risk if it is in service of manifesting new ideas. This fits very naturally with last week's Magician card energy for learning and growth, which is still coursing through us. Now that we have found the right tools to use, we only need to find paths to action. 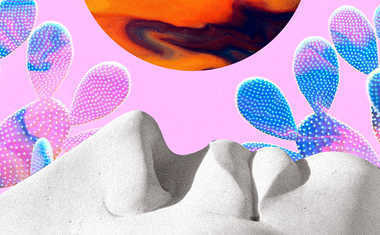 Inspiration can be wasted when it stays in the mind, leading us to the realm of fantasy rather than manifestation. How will you use your Sword now? How will you use your Wand now? How will you use your Cup now? How will you use your Pentacle now? This card shows Death as the Great Mother, a vital, pregnant figure instead of the thin skeleton with scythe we so often see in this card. This emphasizes the rejuvenating aspect of death, that in every passing there is a rebirth of some kind. In literal, physical death, matter and energy are returned to the material and energetic worlds to fuel new life. Symbolically, the Death card is a card of transformation, of moving from one state of identity to another, of being cleansed, of renewal. Much like last month's experiences with the Tower card, Death represents a need for positive change, for letting go of things that no longer serve us. It should absolutely be seen as a positive card and not something to fear. We are fully ready to move on now, to complete one cycle and begin again freshly. Think back to the depiction of this month's theme card, the reversed World, in which we saw an ouroboros symbol, a snake eating its own tail, symbolizing this cyclical nature of life. We now have become that snake and symbolically must shed our old layer of skin, worn down and restrictive, so we may continue to grow. This is the completion of last month's Tower work, the progression of the goals we set at the start of this year, and the final act needed to rebalance the World. Appropriately, we end the month on a card of completion. The Ten of Cups represents being happy and secure in a home base, surrounded by people who care for us. In this deck's depiction, we see symbolic elements similar to those in many World and Magician cards (uncannily the first two cards in this month's spread!) 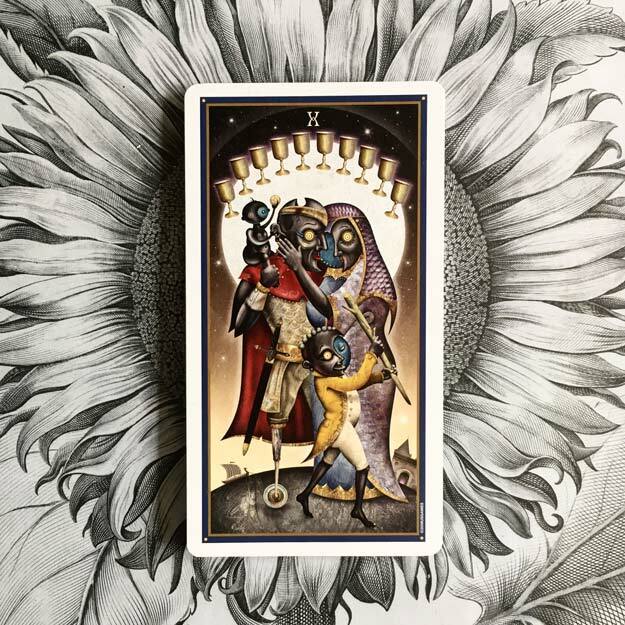 in which the four suits of the Tarot (Swords, Wands, Cups, and Pentacles), representing the four realms of existence (Mental, Spiritual, Emotional, and Material), are all present in in some form. Here, a Sword hangs from the father's belt, representing the mental realm. One child brandishes a Wand in celebration of the spiritual self. The other child holds up a small Pentacle, symbolizing activation of the material realm. And the whole family embraces each other under an arc of golden Cups, representing their emotions and celebration of love. (It could also be argued that the mother in the scene IS herself a cup, a vessel of love and life.) This all suggests that our work this month in these four realms is paying off. Our efforts to right the reversed World have been a success or have the potential to be so in this final week of May. If you are still feeling a lack of completion, the Ten of Cups suggests reconnecting with a home base this week, a place where you feel safe and secure. Where do you feel most at home? (Despite the card's depiction of stability as family, your safe place might be among others or it might be a solitary experience.) Return to that place of protection and acceptance. Let it remind you that all is well within, that you are enough. Spend some time getting to know your new self fully. Keep your tools at the ready for the next phase of growth. Next month, our new cycle of growth starts with a bang. The Judgement card brings an epiphany about our greater purpose -- further realization of where we need to be and what we need to be doing. We will be ready to receive this added information now that we have proven ourselves to be adaptable, capable beings who are in tune with our thoughts, desires, feelings, and needs.